The LAXMAN is intended for all who search for contemporary stress management and who wish to improve their achievement potential efficiently while enjoying an agreeable experience. It offers also the possibility of Neuro-Enhancement without side effects. In a state of deep relaxation, your mind is open to access a wide range of different capabilities. The programs of the LAXMAN directly address these capabilities. Because of its scientifically tested modes of action and the fascinating multi-media applications, the LAXMAN can be used in a large number of different business or leisure situations. The LAXMAN combines highly effective audiovisual stimulation with the features of a state-of-the-art multimedia device. This makes the LAXMAN to one of the most modern and versatile stress management tools. The LAXMAN is the first device to combine all the assets of a conventional ?mindmachine? with the characteristics of a state-of-the art multimedia device: an MP3 player and specifically designed All-Color-Ganzfeld-Goggles. The product is complemented by other features like intuitive menu control, four hours of exclusive ambient sounds (some of them composed by the well-known mental trainer Michael Hutchison), expandable memory (SD card), its own editor software, a USB interface, top quality casing, and many other technical attributes that should leave nothing to be desired. The LAXMAN is the only light and sound relaxation system that allows you to add neurologically effective visual structures to your own music tracks and to carry light and sound in one single device. Use the MP3 player to create your personal 'sessions' ? enjoy your own music not only as an auditory but also as a visual- and sensual experience! 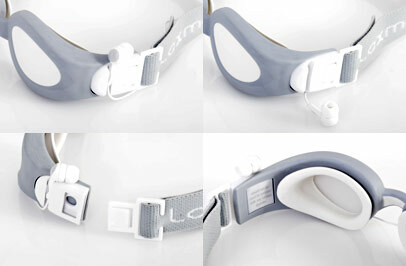 The LAXMAN breaks new grounds: the patented LAXMAN glasses can create every color of the light spectrum. The light is transmitted indirectly onto the closed or open eye. Interference patterns generate kaleidoscopic structures in all colors. These structures are programmed in accordance with neurophysiological research findings. Additionally, a Ganzfeld effect is generated to enhance the experience. The device can also be used in color and light therapy to counteract the lack of light in winter. In a session, you also wear headphones to enjoy the auditory stimulation. Contrary to traditional systems, the LAXMAN audio range also comprises ambient and nature sounds. But the LAXMAN also creates the classical impulse frequencies known from conventional mental training systems as well as Binaural-beats and Hemicircle Sounds, which provide a very special sound experience. These impulse frequencies define rhythms the brain will happily follow. The device has 22 pre-installed programs or sessions for various situations that run 20 minutes each. 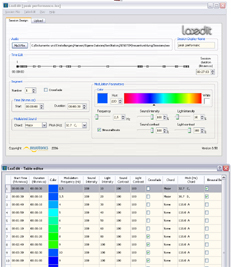 Professional users have the option to set frequencies and other program characteristics manually. The expandable memory card provides enough space for a large number of self-created sessions or MP3 titles. With the user-friendly Session Designer software LaxEdit, convert your own audio tracks into psychoactive audiovisual Laxman sessions tailor-made to your individual tastes. Basically, the LAXMAN works on simple, natural principles: everybody knows that it is relaxing to watch a flickering flame or the glittering surface of a lake. The LAXMAN uses underlying physiological mechanisms which are known as the ?frequency following response?. The relaxation you feel when gazing into an open fire, for example, is caused by a change of the brain wave pattern. The frequency of these patterns defines our mood. Visual and auditory stimuli may influence this frequency from the outside - as can be seen in EEG tests. Over the last decades, this principle has been the subject of numerous studies. The great majority of the scientific tests showed extremely positive results. A profund study with the Laxman at the Charité in Berlin shows an improvement of concentation of about 14% and an improvement of Relaxation of about 20% after a three weeks application. The system very effectively creates a state of relaxed clarity and concentration. Furthermore, the receptiveness e.g. for study contents is increased significantly, and the perfusion of the brain is optimized ? this supports mental fitness.